It's all about the music. It's not about you! 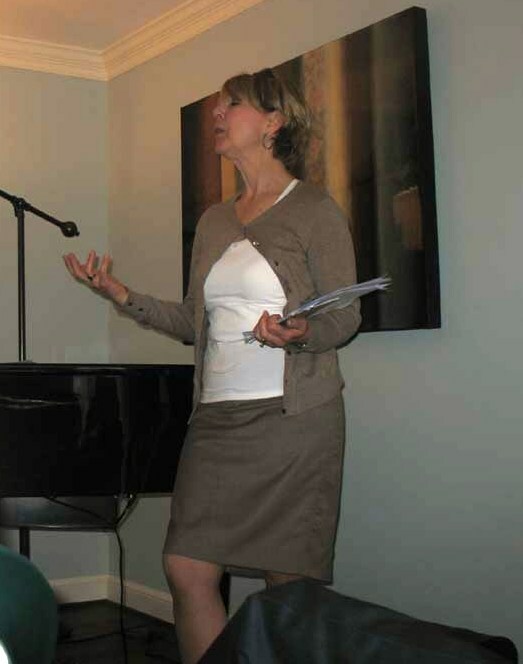 This was the key message from mezzo soprano and performance anxiety coach, Dr. Eva Nagorka, at the March 24, 2012, Adult Music Student Forum workshop on performance anxiety in Potomac, Maryland. Dr. Nagorka offered a variety of suggestions to help performers understand and manage their reactions to stress so that the pleasure of making and sharing music becomes the central experience of performing. Special Events Coordinator Dorothea Shellow welcomed Eva, the five performers and about 20 additional AMSF members who gathered at a member home for this workshop. AMSF founder Matt Harre introduced Dr. Nagorka, noting that she had been a charter member of AMSF and the organization's first secretary-treasurer. Eva began by acknowledging that she, too, experiences performance anxiety when she sings, but not in other contexts. She noted that both the body and brain react to stress, and she emphasized that each person's reactions are unique, depending on his/her life experiences. When we perform, our brains say, "let's review your life." We bring with us memories of parents, children, spouses, teachers, and even the 6th grade play when we forgot our lines. There is constant chatter in our brain, and sometimes we even bring out a mental "whip" to punish ourselves. When we feel threatened or perceive danger, our body responds by pumping adrenalin that may cause shaking hands, trembling knees, shallow breathing, sweating palms, and racing hearts. These reactions may be useful when facing true physical danger, but they can hinder musical performance. Dr. Nagorka stressed the importance of performers understanding how their minds and bodies react to the stress of performing. After each workshop performance, she questioned the performer, asking how she felt physically and what thoughts went through her mind while performing. She asked performers to try various techniques to release tension and become more focused on the music while performing a second time. The results were fascinating. Anne Williams was the first performer, playing Chopin's Nocturne, Op. 15, No. 2, in F# major. Afterwards, Anne noted that her heart had been racing and that she felt tension in her upper arms. She described thinking about the more difficult passages, wishing they would "get out of the way," and thinking "please let me get through this." She felt as if her technique just fell away, belying all her practice. Eva asked her to play the same passages while waving papers in Anne's face, taking up one arm and then the other, and weaving her torso around. She asked Anne to sing the melody, then identify a character and tell the story of the piece and narrate it as she played it through again. 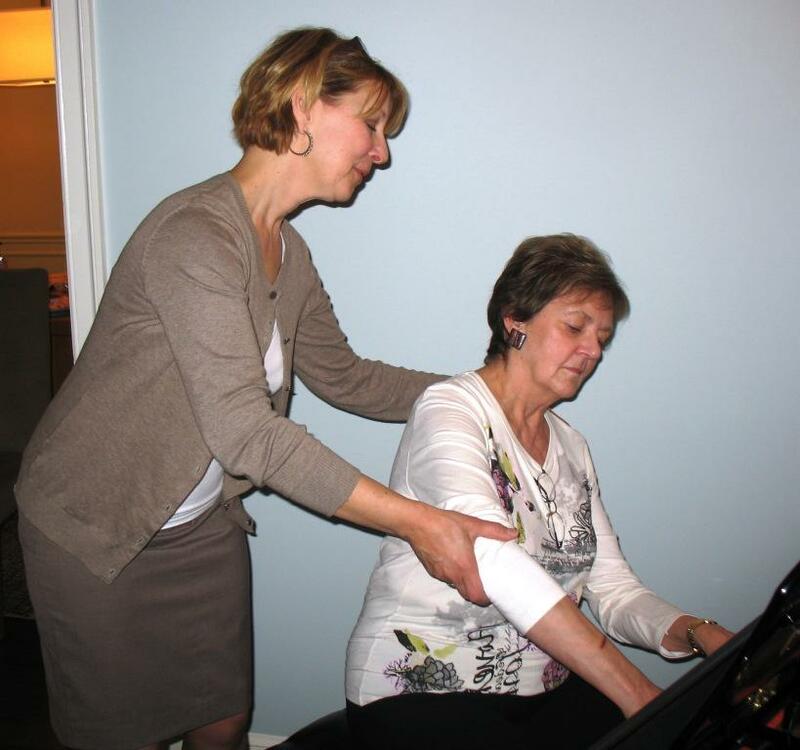 Anne noted that it was easier to play the second time, but that she hit more wrong notes due to the distraction of trying to talk and play at the same time. But the audience didn't notice the wrong notes and described her playing as more lyrical and engaged the second time around. Eva noted that playing the second time seems easier because you become more comfortable and desensitized to stress the more often you play. That means that the only way to become more comfortable performing is to perform more often. Susan Hill followed Anne, playing from memory the Saraband, Minuet, and Gigue from J.S. Bach's Partita in Bb. She noted that her hands were cold, that she sped up while playing, and that she was worried about remembering the score. Eva asked her to put on a big "Miss America" smile and to turn and smile at everyone in the audience while playing the piece again. Then she had her play without actually looking at the audience, but imagining the same connection with the audience. Although Susan was concerned about memory slips when looking around, she played more slowly and the audience felt that her playing sounded more free and dance-like. Eva stressed how important it is to feel connected to the audience. Eva also asked Susan to play while dropping her jaw down and repeating a name over and over, noting that releasing this one point of tension will help loosen up the whole body. Soprano Tina D'Souza, accompanied by Pat Veliotes, sang "Someone to Watch Over Me" by George and Ira Gershwin. Tina expressed concern that this audience of musicians would know more about music than she does and would think she is "not really a soprano." 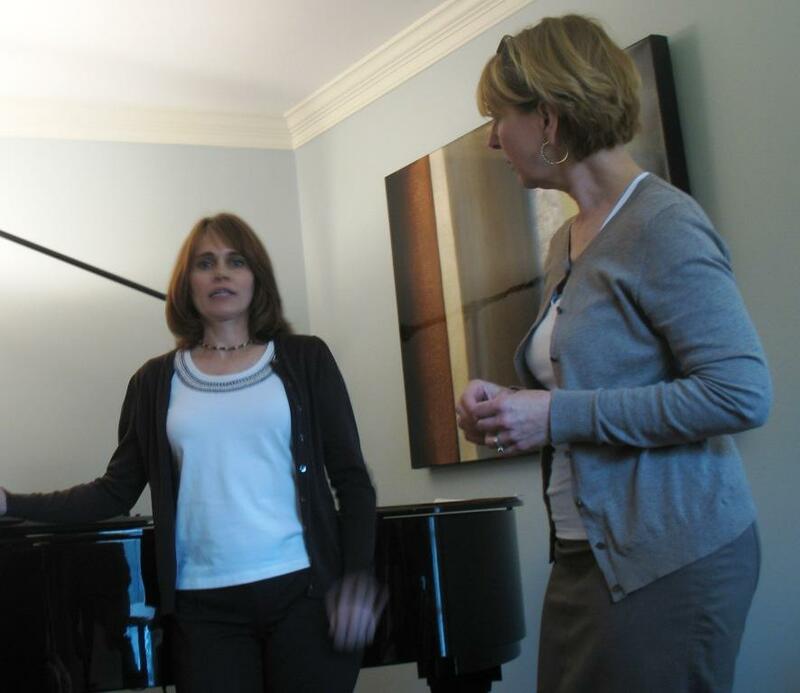 Tina explained that she sang in choruses as an alto for 20 years, and only discovered that she is actually a soprano when she started taking voice lessons a couple of years ago. But Eva pointed out that very few in the audience had ever taken voice lessons and thus know less than Tina does about singing. Eva suggested that Tina find a Gertrude Lawrence recording of the song to get a feel for the history of it (Lawrence sang it in the original Broadway show). 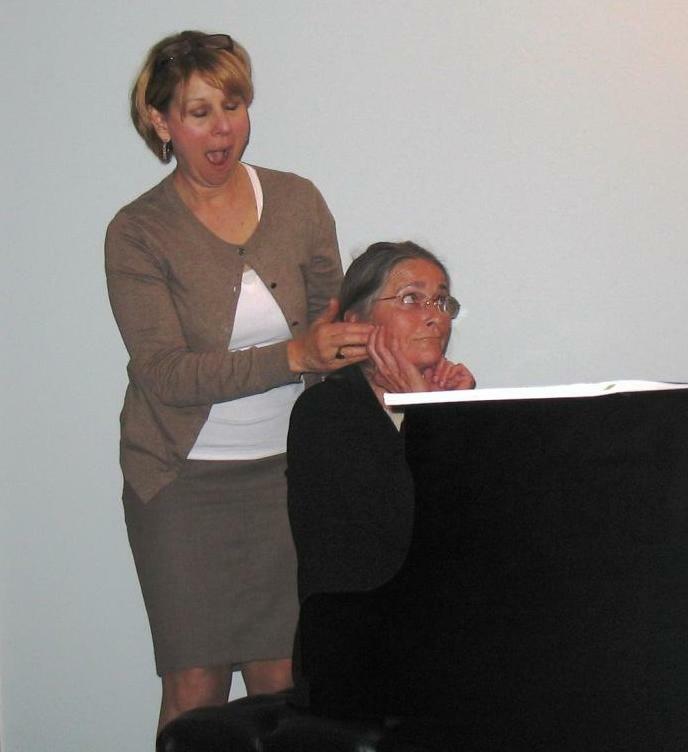 She also asked Tina to think about the story of the song and sing it again, this time to her accompanist. As she began to sing, Eva walked her around to cue the pianist, and then had her face and sing to each person in the audience. Eva moved Tina's arms around in big gestures, and then as if she were conducting. The audience noticed that Tina became more emotional and more connected to the audience and also seemed to be having more fun. "Telling the story" is essential, and it can be easier for singers because they have the luxury of words. But Eva observed that all performers must share a part of themselves with their audience, and that is an intimate and scary act. 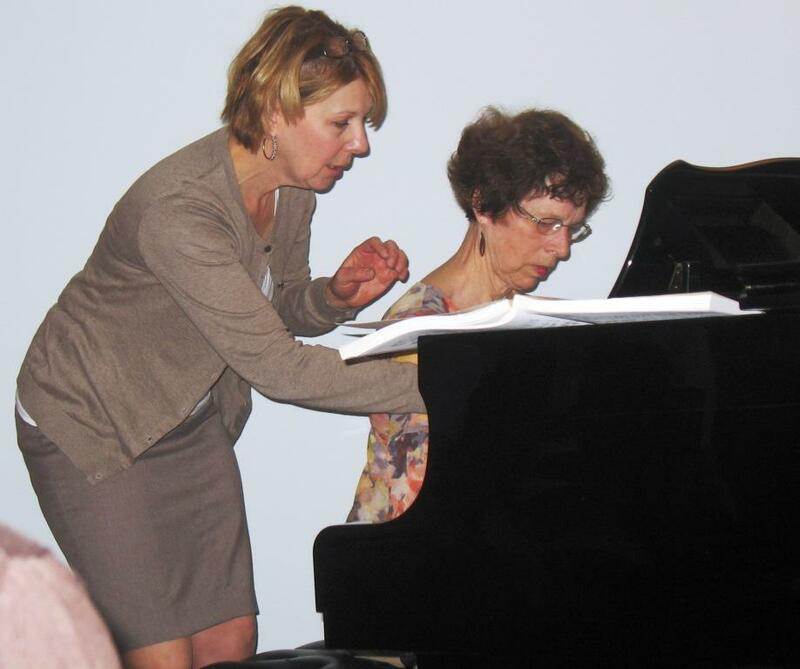 Debra Morris next played the Adagio movement from Mozart's Sonata in F Major, K. 332. Debra said she felt her face getting red, that her mind went blank; she felt frozen and couldn't think clearly. She felt that she couldn't seem to get the music under control, but kept making mistakes. She worried about being the center of attention with everyone listening and "judging." She would prefer to play background music while everyone kept talking. Eva noticed some of the markings in Debra's score--"Don't rush! On the beat! Lighter!" Eva suggested being kinder to herself, rephrasing these harsh directions, speaking in a whisper rather than shouting. Eva asked Debra to play games with the music, first playing very fast, then very slowly, then very angry, then shouting. Eva also asked Debra to hum the melody, and to think about the story of the piece and what was happening in the story when the music modulated. When Debra played through her piece a second time, Eva walked around her crinkling and tearing paper, coughing and whistling. Debra said she felt more comfortable because the audience was watching Eva rather than her. Although she was distracted by Eva's antics and felt they were even humorous, she tried to remain focused on playing. The audience noticed that Debra really connected with them and played with more melodic expression the second time, even while laughing. Since distractions are inevitable, Eva suggested deliberate practice with distractions to increase the ability to focus. Nancy Colburn was the final performer. She played the exposition section of the first movement of Beethoven's Sonata Op. 22 in Bb. Nancy noticed that her fingers became sweaty, causing her to slip on the keys. She said that she sometimes feels she is flowing with the music but then just loses focus. Eva asked Nancy to play the piece again as Liberace might play it, smiling and with exaggerated gestures, forgetting about the notes, and just entertaining the audience. Nancy was asked to laugh as she played and to bounce up and down. The audience noticed that Nancy seemed to be having more fun, and her playing was more fun and energetic. Nancy described being more "in the zone." Eva identified this feeling as "flow", when you are not trying so hard but give up something of yourself and give a performance where time just stops, the music is all there is, and the audience is totally pulled in. Eva summed up by observing that we all play music because we get so much pleasure from it. We need to think about the pleasure, the beauty and the fun and share all that with the audience. There are various ways to keep focused on the music--learn the history of the piece, create a narrative, add words to the melody, sing, think about the mood and the direction of the notes. We need to understand our unique responses to performance stress, and after acquiring the necessary skills, we must then let go, forget about the wrong notes, get out of our heads, and imagine ourselves giving a great performance that is all about the music. Participants in Performance Anxiety Workshop led by Eva Nagorka. 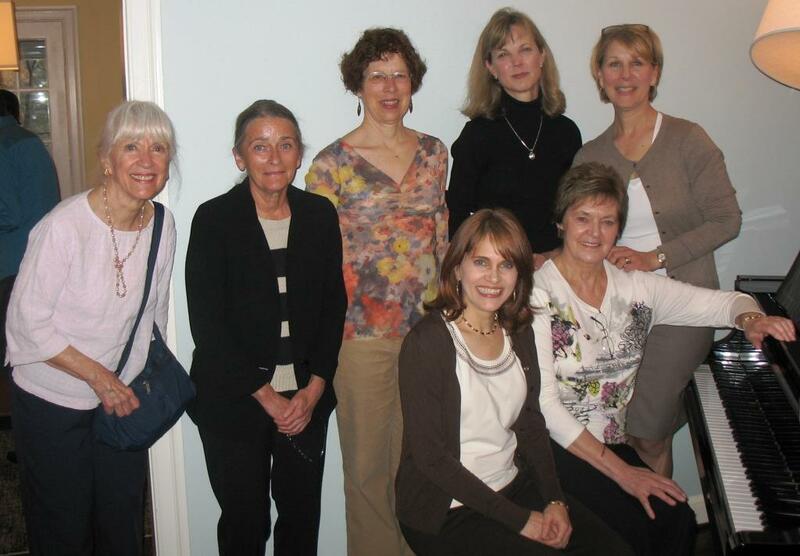 Left to right: Pat Veliotes, Susan Hill, Nancy Colburn, Tina D'Souza, Debra Morris, Anne Williams, Eva Nagorka. Students who would like to know more or have a private session with Dr. Nagorka may contact her by email or at (603) 245-6620.